Acriticism directed at evidence based medicine is that it ties the hands of practitioners and robs patients of their personal choices in reaching a decision about optimal care.1 There are many barriers to implementing health research in practice,2–4 but, conceptually at least, tying clinical hands and robbing patients of their choices are not among them. Rather, patients' preferences were incorporated into the first model of evidence based medicine5 and their importance has been underscored in a recent revision, depicted in the figure. In this figure, clinical decisions must include consideration of, firstly, the patient's clinical and physical circumstances to establish what is wrong and what treatment options are available. Secondly, the latter need to be tempered by research evidence concerning the efficacy, effectiveness, and efficiency of the options. Thirdly, given the likely consequences associated with each option, the clinician must consider the patient's preferences and likely actions (in terms of what interventions she or he is ready and able to accept). Finally, clinical expertise is needed to bring these considerations together and recommend the treatment that the patient is agreeable to accepting. In any one situation the patient's clinical state and circumstances may predominate. For example, a person who experiences chest pain while staying in a remote location may have to settle for acetylsalicylic acid, if it is the only effective treatment at hand, whereas one in a larger community will likely have many more treatment options. In another situation, the patient's preferences may take precedence. For example, a person experiencing a life threatening haemorrhage who holds a religious belief that dictates against blood transfusion may accept only an alternative. By contrast, evidence alone does not make decisions. Thus, an evidence based decision about anticoagulation for a patient with atrial fibrillation is not only determined by the demonstrated efficacy of anticoagulation and its potential adverse effects,6 but will vary from one patient to another according to individual clinical circumstances (for example, the patient's age and history of bleeding) and their preferences. A recent study has shown, for example, that patients vary widely on the risk of haemorrhage they would accept in return for a reduction in stroke risk.7 Furthermore, in this study, patients were generally much less averse than physicians to bleeding as an adverse consequence of prophylaxis against stroke with warfarin or aspirin. The notion that decisions may vary from circumstance to circumstance, and from patient to patient with the same circumstances, has received increasing attention. But achieving the right balance among the factors that can affect a decision is not necessarily easy. Indeed, providing evidence to patients in a way that allows them to make an informed choice is challenging and in many cases beyond our current knowledge of doctor-patient communication—very much a problem awaiting the generation of new evidence. The term evidence based medicine was developed to encourage practitioners and patients to pay due respect—no more, no less—to current best evidence in making decisions. An alternative term that some may find more appealing is research enhanced health care. Whichever term is applied, one can be confident in making better use of research evidence in clinical practice, especially if the wishes of the patient are taken into account. A longer version of this article appeared in ACP Journal Club 2002 Mar-Apr;136:A11-14. Figure reprinted with permission of the American College of Physicians—American Society of Internal Medicine, from Haynes RB, Devereaux PJ, Guyatt GH. 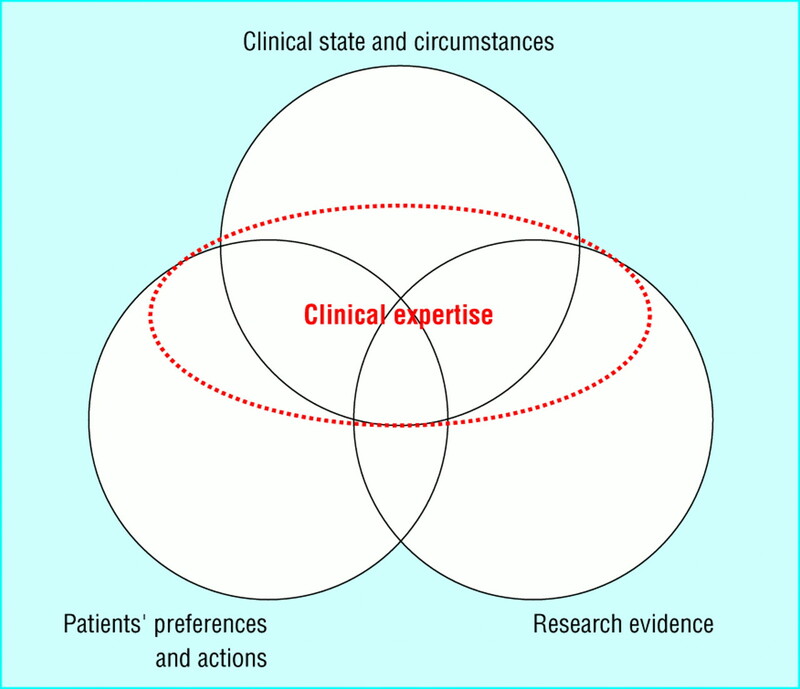 Clinical expertise in the era of evidence-based medicine and patient choice [editorial]. ACP Journal Club. 2002 Mar-Apr;136:A11-14.
. You have a choice, dear patient. BMJ 2002; 324: 674.
. Barriers and bridges to evidence-based health care practice. BMJ 1998; 317: 273–276.
. Why general practitioners do not implement evidence: qualitative study. BMJ 2001; 323: 1–5.
. Obstacles to answering doctors' questions about patient care with evidence: qualitative study. BMJ 2002; 324: 1–7. Evidence-based medicine: a new approach to teaching the practice of medicine. JAMA 1992; 268: 2420–2425.
. Antithrombotic therapy to prevent stroke in patients with atrial fibrillation: a meta-analysis. Ann Intern Med 1999; 131: 492–501.
. Differences between perspectives of physicians and patients on anticoagulation in patients with atrial fibrillation: observational study. BMJ 2001; 323: 1218–1222.